This award is given annually to the top amateur Coach who exemplifies the spirit of Rod Dedeaux’s legacy as a coach and mentor in the sport of baseball. Jim Leyland served as a Major League manager for 22 seasons, leading the Pittsburgh Pirates (1986-1996), the Florida Marlins (1997-1998), the Colorado Rockies (1999), and the Detroit Tigers (2006-2013). Leyland ranks 15th on the all-time wins list among Major League managers with 1,769 wins. He was named the National League Manager of the Year in 1990 and 1992 and the American League Manager of the Year in 2006. Leyland led the Florida Marlins to a World Series title in 1997 and the Detroit Tigers to two American League Championships in 2006 and 2012, before stepping down as manager after the 2013 season. Following his retirement as a Major League manager, Leyland made his international baseball debut as Team USA’s World Baseball Classic Manager in 2017. He led Team USA to its first-ever World Baseball Classic title when it defeated Puerto Rico, 8-0, in the gold medal game at Dodger Stadium. The team finished the tournament with a 7-2 overall record and its success led to Leyland being named the 2017 USA Baseball Rod Dedeaux Coach of the Year. The Rod Dedeaux Foundation is proud to honor Jim Leyland as this year’s recipient for his outstanding leadership, diligent work ethic and impeccable knowledge for the game. George Horton began his coaching career the same place he began his collegiate playing career, Cerritos College. He coached there for two seasons before moving onto Los Angeles Valley College. From there he went back to Cerritos College as an assistant, before eventually becoming the head coach. He was later hired by his former coach, Augie Garrido, to be an assistant at Cal State Fullerton. When Garrido left in 1996, Horton was hired to replace him. Horton was named 2003 National Coach of the Year by Baseball America. In 2004, he would face off against his old boss in the College World Series. The Fullerton Titans won the series… and the national championship. Horton was named the head coach of the University of Oregon in 2007. In 2010, he led the Ducks to a 40–24 record, and a trip to the Division I Tournament. 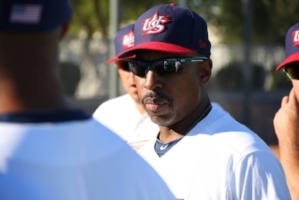 The 2015 Rod Dedeaux USA Baseball Coach of the Year Award recipient was Willie Randolph, a baseball veteran with 18 years of playing experience and 16 years of coaching and managerial experience. Randolph, a six-time All-Star selection, made his major league debut in 1975 and played the majority of his career with the New York Yankees, winning back-to-back World Series in 1977 and 1978. He later won four more championships as a coach with the Yankees and served as the manager of the New York Mets from 2005-08. Randolph led the Mets to the National League East Division title in 2006, as the Mets fell one game short of the World Series. Randolph has seen time with ESPN as a baseball analyst and was the third base coach for Team USA at the 2013 World Baseball Classic. Most recently, he served as the manager of the inaugural Premier12™ team that won a silver medal and was honored as the 2015 USA Baseball Rod Dedeaux Coach of the Year. The 2014 Rod Dedeaux USA Baseball Coach of the Year Award recipient was Andy Stankiewicz, whose extensive coaching career includes leading a dominant 18U National Team to a gold medal at the COPABE Pan American Championships in La Paz, Mexico, and the 2012 USA Baseball’s Collegiate National Team to a Bronze Medal. Andy managed the minor league Staten Island Yankees and won the New York-Penn League title in 2005, worked as a scout for the New York Yankees, and was an assistant baseball coach at Arizona State where he helped guide the Sun Devils to three Pac-10 Championships and two appearances in the College World Series. Since he became head coach of The Grand Canyon University Antelope’s in 2012, Stankiewicz has led them to the NCAA Division II Baseball Championships in 2013 with a 40-19 record, and has helped earn the Antelope’s a Division I status. Stankiewicz was named both The ABCA/Rawlings Division II West Region Coach of the Year and The Pacific West Conference Coach of the Year. Before beginning his coaching career, Stankiewicz was a standout infielder at Pepperdine University and played seven seasons in the Major Leagues, with the Yankees, Astros, Expos and the Arizona Diamondbacks. Rob Cooper was the 2013 Rod Dedeaux USA Baseball Coach of the Year Award Winner. In 2013, he traveled to Taichung, Taiwan as the head coach of the USA Baseball 18U National Team for the IBAF ‘AAA’/18U World Cup. He led the team to an 8-1 record in the tournament and a second consecutive gold medal. He joins such legendary coaches as Scott Brosius, Davey Johnson and Tommy Lasorda as a Rod Dedeaux USA Baseball Coach of the Year. A native of California, Cooper is now serving as the head coach at Penn State University. Prior to that, he spent nine seasons as the skipper at Wright State where he led the team to seven 30-win seasons, six Horizon League Championship game appearances and three Horizon League Tournament titles. He also spent time coaching at Oral Roberts University, Tulane and Miami (Fla.), and he was an associate scout for the Los Angeles Dodgers for two years from 1990-92. An alumnus of Miami, he has a bachelor’s degree in psychology and a master’s degree in sports sciences in administration from the school. He has a wife, Maureen, and two sons, Jake and Tyson. Scott Brosius led the 2012 USA baseball 18U National Team to it’s first World Championship since 1999, leading the Red, White and Blue to gold at the IBAF 18U World Championships in Seoul, South Korea. Brosius was initially tabbed as manager of the I8U team in February of 2011. That year he led the club to a gold medal at the COPABE Pan American AAA/I8U Championships in Cartagena, Colombia, an achievement that also earned him recognition as the 2011 USA Baseball Coach of the Year. Scott Brosius enters his sixth year as Lynfield head baseball coach. During his first four seasons, Brosius has compiled a 158-64 win-loss recordwhile leading the Wildcats to three Northwest Conference Championships and two regional titles. In 2008, he led the Wildcats to a fifth-place finish at the NCAA Finals and also guided Lynnfield to third place at the 2010 NCAA championship tournament. Brosius’ Major League career spanned over 11 seasons during which he won three World Series Titles with the Yankees in 1998, 1999 and 2000. Brosius was a Golden Glove award recipient, was namend the Most Valuabe Player of the 1998 World Series and played in the 1998 All-Star Game.